You’re very welcome! I wish I had discovered her a lot earlier. She feels like the perfect writer to read when you are young and innocent (and quite possibly in the first flushes of love). Lovely review, this really appeals and I can’t remember ever reading a review of it before so thank you for introducing me to it. I too loved Bonjour Tristesse which I have read twice so I really must add this to my wish list. You are most welcome. The only review I could recall seeing was Kaggsy’s, maybe a year or so ago, but it was enough to make me seek out a copy of the Irene Ash translation I think there’s every chance you would enjoy this, Ali. While it’s not as dramatic as Bonjour Tristesse, it does capture that feeling of being young and somewhat uncertain about life. Lovely review Jacqui and thanks for linking to my post! I did enjoy this book – so evocative – although I have had less success with later Sagan books. How did you find the Ash translation? Thanks, Karen. No problem at all about the link – it’s always nice to include one or two where possible. I really liked the Ash translation – it seemed to have a lightness of touch that complemented the story, a sense of fluidity if you like. That said, I haven’t compared it with Heather Lloyd’s version (which I do have somewhere as it came as part of the Penguin reissue of Bonjour Tristesse). That’s interesting about her later books. I recall some of your other less successful experiences – The Heart Keeper, if my memory serves me correctly? Do you think she peaked at a young age then? I guess I’m wondering if it’s worth reading any of her others…there are quite a few by the looks of things. Yes, the Heart Keeper was difficult and I admit it kind of put me off reading more of her. But it may not be representative of her other books! That’s funny because I think The Heart-Keeper is her best book! But she has had a couple misses for me so that makes sense. I find that stories of world weary people to usually be interesting. Perhaps such characters reflect something of the troubles that are inherent in life in general. The relationships in this book also sound very interesting. Thanks, Brian. Yes, it was an enjoyable read. I think it captures the sense of listlessness that sometimes accompanies us in our teenage years. It’s fascinating how you can follow the life stages of a woman and her love affairs via Sagan’s books: from Bonjour Tristesse to A Certain Smile to Do You Like Brahms? Although she wasn’t necessarily the same age as her protagonists at the time (only in the first one). If you haven’t read Do You Like Brahms, I do recommend it. And the film is brilliant too, with Ingrid Bergman and Anthony Perkins. Hmm, I’ve just had a quick peek, but the English translation looks hard to find. l might have to hunt around a bit for a copy of it. Love the sound of the film too, especially the Bergman-Perkins connection. Thanks, Marina. Quelle coincidence ! This is on my TBR lined up for for my next book in french . I’m looking forward to it …..although her books are v short I find her extremely difficult to read in French ….the sentences are so complex ! As you say she certainly knows how to create an atmosphere. Quelle coincidence indeed! I think you’ll enjoy this – it feels like the perfect summer read. Isn’t that interesting about her being difficult to read in French. At first sight, her prose (well, the English translation) seems so simple, and yet there is a degree of depth underneath – certainly in terms of the mood and emotions being conveyed. I’ll be interested to hear how you get on with the French version. Good luck! I read this and Bonjour Tristesse in French decades ago. I remember enjoying them both. Glad you enjoyed it too. What I liked most about this was the mood that Sagan had created – there was something very evocative about it. Ha! Bonjour is the one to start with, for sure. Plus, as it’s only around 100 pages, there should be no excuse! Which translation do you have? Thank you for another share, always appreciated! I read this book years and years ago and so, not for the first time, I have to say thank you for a lovely reminder. You’re very welcome. It’s nice to be reminded of old friends very now and again. In some ways, I wish I had started reading her several years ago when I too was a young girl like Dominique. I’ve only read Bonjour Tristesse by this author and really enjoyed it – this does sound very tempting! Surprisingly so, because I tend to find portrayals of young love tedious :-D But the beauty of her writing wins me over! You know, I wonder whether part of the charm of these books stems from their brevity. 200 pages of Dominique’s deliberations about and Luc might get a little wearying, but around half of that length feels just about right. She is a reader’s writer if that makes some kind of sense – while her prose isn’t the most lyrical or flamboyant I’ve ever encountered, it has an effortless elegance which seems ideal for these stories of young love. Similar territory to Tristesse, but then lots of authors explore the same territory repeatedly and to good effect. It does sound good. I have the Lloyd translation. What made you pick the Ash? It was the Ash version of Tristesse that I read and I admit I did find it very fresh and lively, but I had the impression the Lloyd was possibly more accurate. Yes, indeed. They are recognisably the products of the same author – the style here is similar, even if the story is a little less dramatic. I actually have both translations of this as Lloyd’s version of A Certain Smile came with my Penguin re-issue of Bonjour Tristesse. That said, I haven’t compared them in detail, only the opening chapter to get a feel for how they would read. You’re right to say that the Lloyd is more accurate, certainly as far as Tristesse is concerned – that’s the reason I bought it in the first place. But then, just around the time that I was reading it, this article appeared in The Guardian suggesting that Ash’s original version was more bouncy – it had a lightness of touch or ‘spring in its step’ that seemed to be missing from the Lloyd. If truth be told, I think Ash did quite a bit of editing on Sagan’s original text when she translated it – not just the removal of sections or lines that were considered too risque for an English-speaking audience in the 1950s, but some smartening up of the prose as well. Anyway, to cut a long story short, I decided to read Ash’s version of A Certain Smile as a result of a) Rachel Cooke’s article on the translations of Tristesse, b) your very positive response to Ash’s translation of Tristesse, and c) my own preference for Ash’s version of the opening chapter of A Certain Smile compared to Lloyd’s. I have the Ash translation of Tristesse now (the one with the unmistakably French cocktail on the cover), so I may well read it at some point. It’s such a classic story, timeless in some ways. Great review. I read this a while back and felt kind of conflicted about it, and knowing you had read more of her work and liked it I’ve been curious what you’d think about this one. To me it never got more than a middle ground, I like some aspects of it, but not enough to feature it on my blog e.g. I couldn’t quite put my finger on what it was, but one thing I did love about this book and would like to hear your opinion on is the fact (spoiler) that she named the wife of the uncle after herself. She did write the book when she was about the same age as the main character, so it’s so strange that she would give her own name to the scorned woman. Thank you. I can understand why some readers might find it a little underwhelming, certainly compared to the sheer perfection of Bonjour Tristesse. It certainly isn’t as dramatic as her debut. Nevertheless, I did enjoy the tone and mood of this book, that feeling of being young and uncertain and a little bit conflicted about life. You know, I hadn’t even thought about her use of Françoise as the name of Luc’s wife until you mentioned it here. Maybe that’s how Sagan imagined herself in the future, as the damaged wife whose husband has been unfaithful? In many ways, Sagan seems wise beyond her years with an acute awareness that love is often fleeting or short-lived. I certainly got that feeling with Bonjour and Raymond’s succession of attractive young playmates. What do you think about her use of Françoise here? I’d love to hear your thoughts on its significance. Honestly, when I looked up how young she was when she published the book it made me think if maybe there was something auto-biographical about the story. Maybe she did have an affair with an older, married gentleman and the feelings the main characters go through mimic Francoise’s. She did marry a man 20 years her senior just a few years after this book was published. In that sense naming the scorned wife could have been her way of trying to atone. But when I thought about it, that seems like a too shallow explanation. Not everything has to be auto-biographical. Maybe it’s more simple, that Sagan is pointing to the character that she wants to be more like. Often with books like this we see the main character and want to be her, despite or because they are young and reckless. Maybe Sagan is saying that’s not the “right” call, that it’s better to be the older, kinder, smarter women, even if you are cheated on. That’s interesting. 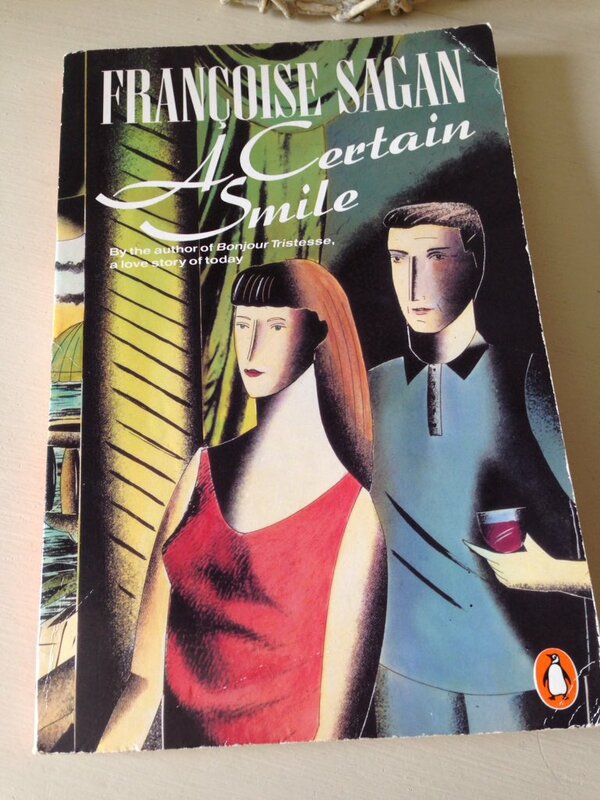 I like your second theory, the idea that Sagan wishes to be more like Françoise in the book – she certainly comes across as kind and gracious in her dealings with Dominique, at least at the beginning of the story before the affair gets going in earnest. I’d quite like to read another of Sagan’s books at some point, maybe something she wrote a little later in life to see how it compares. It kind of surprised me that she (the author through the main character) was so kind towards Dominique. You could easily have seen a character being jealous and smarmy, but she does reflect that what they are doing is wrong because it hurts Dominique (not so much her boyfriend). I agree it would be interesting to read some of her latest works. I do wonder why it’s not more known considering Tristess is so known. I mean C. Brontë is mostly known for Jane Eyre, but people still read her other works, mostly due to Jane Eyre. That’s a good point about the nature of Dominque’s feelings. I liked the way Sagan captured that aspect of her character. Also, by the end of the novel, there’s a sense that she’s ready to move on, to start afresh with the next phase of her life. I liked that too – there was a feeling of hope or optimism about it. Sagan later works seem much harder to get hold of than Tristesse and A Certain Smile, certainly in terms of sourcing the English translations. It’s strange, isn’t it? There must be an opportunity there for the right kind of publisher. Good point. I hope someone does decide to reissue Sagan’s backlist. It would be great to see the English translations back in print! I also recommend Do You Like Brahms. Thanks, Emma. I actually found an old copy online after a bit of a hunt, so it’s good to hear that it comes with your seal of approval too! I have a copy of Bonjour Tritesse following your excellent review of this novella – this also sounds like one I’d enjoy especially as she has captured those youthful emotions so well.. Great review Jacqui. Thanks, Cleo. If you have the recent Penguin edition (Heather Lloyd’s new translation of Tristesse) then you’re in luck as it also includes her version of A Certain Smile. Think of it as an extra bonus – not quite as gripping as Tristesse, but still very evocative. You’re very welcome. Lloyd’s translations seem to be more accurate than Ash’s, but they lose something in terms of readability. Lloyd’s version of Bonjour Tristesse worked for me when I read it last summer, but then I ended up switching to Ash for A Certain Smile. You might want to take a look at both at some point, just to see which version you prefer.